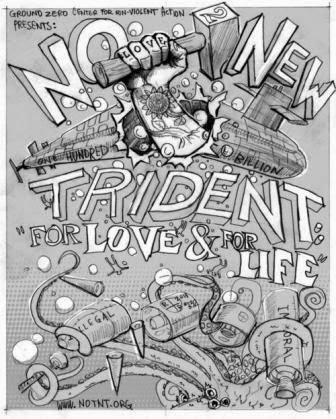 NO To NEW TRIDENT - For LOVE & For LIFE: No slush fund for New Trident - Urgent ACTION ALERT!!! No slush fund for New Trident - Urgent ACTION ALERT!!! Nuclear ballistic missile submarines are pretty easy to hide beneath the briny deep as they patrol the seven seas ready to launch their nuclear-armed missiles, each loaded with multiple (and large yield) thermonuclear warheads. Then again, it takes some slippery members of congress to hide 12 of these behemoth subs from the accepted Congressional budgetary funding method. Our colleagues at Physicians for Social Responsibility think its time to call the newly created National Sea-Based Deterrence Fund what it is - a sham!!! PSR opposes the nuclear modernization programs now underway in all nine nuclear weapon states. They believe it's time to stop wasting taxpayer money on modernizing these arsenals, and instead, start focusing on disarmament efforts. The Navy plans to build a whole new fleet of 12 ballistic submarines to replace the current Trident subs. Recognizing that this is a budget buster, some members in Congress have created a new slush fund to pay for it. Instead of incorporating the funds needed for these subs in the Navy's budget, they have proposed a separate fund called the "Sea-Based Deterrence Fund". This will allow it to avoid the cap currently on all federal spending since it will cost roughly $100 billion for all 12 submarines. 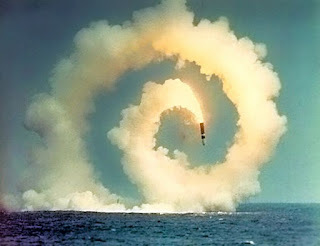 Exempting ballistic missile submarines from budget caps sets a very bad precedent. The Navy needs to prioritize its budget, just like any other government agency. The money for new submarines shouldn’t be coming out of a special fund. In fact, the Navy shouldn't be building new ballistic missile submarines at all; the President should be in active negotiations with President Putin to ramp back both nations current nuclear modernization and lead the way to disarmament! The current House Defense Appropriations bill includes language that forbids putting any money into this Sea Based Deterrence Fund. This is a very good thing. But we are expecting an amendment on the floor to strike that language. Please ask your U.S. Representative to oppose any such amendments. Please take action RIGHT NOW since this amendment could be voted on as early any day now. Email and tell your Representative to enforce budget discipline and encourage the Navy to live within its own means, just as it has historically been required to do. But don't take our word for it; you can read about this in Taxpayers for Common Sense recently published "TCS analysis of National Defense Authorization bill for Fiscal Year 2016." 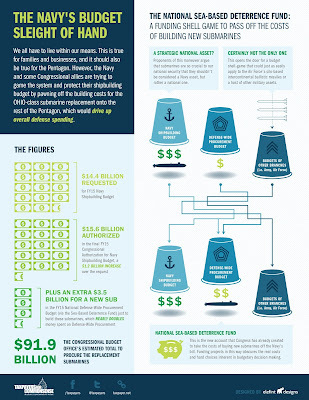 In it TCS takes aim at the "budgetary shell game" being played here to get New Trident built at all (taxpayer) costs! Click here to download the TCS infographic shown above.